This is the second part in a five-part series that translates a lecture made by Morishima Tateo. To see the rest of the published series plus a bio on Morishima sensei, please click here. First let me talk about the pressing issue of instructor development. There is something called “sanma no gurai” (三磨の位). As you all know, this came from the secret teachings of Yagyu shinkage-ryu. This is tightly connected to instructor development, so I’ve picked it up for use here today. Of course, whats alluded to here is not only limited to kendo, other fields of study have the same problems. For kendo, finding yourself a good teacher to learn from is the most important thing for improvement, and you should actively pursue this goal. 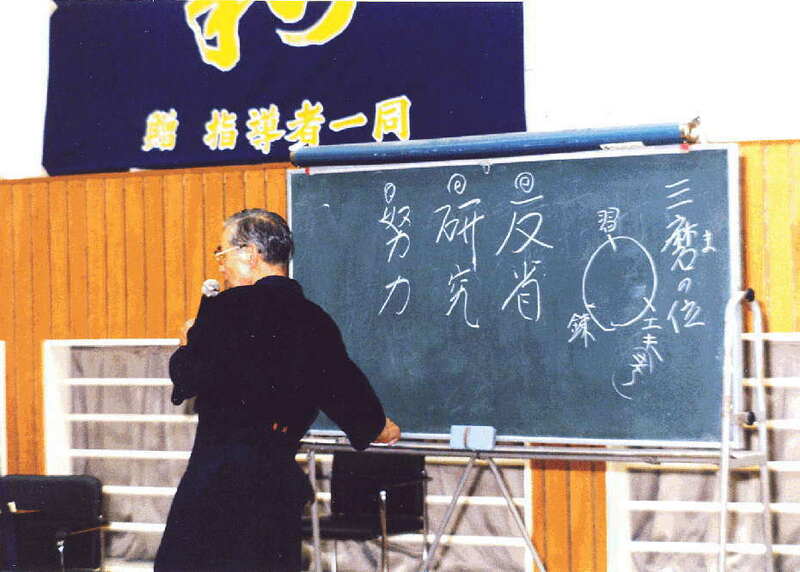 Doing kendo without studying under a good teacher is not part of the “way.” We study kendo to “mould the human character.” For that reason we do various kinds of keiko in various places, but without a good teacher to teach you the correct path this “moulding” of the human character cannot occur. 練 (REN; known to casual Japanese speakers as neru or the ren in renshu, to practise/train/drill/polish) is about keiko. Kendo is from the start to the finish about keiko. Teachers of past times used to say “Keiko! Keiko! Just do keiko! Theory will come later” all the while smacking your behind with their shinai (i.e. “shut up and train”). 工 (KO or KU; means to craft or construct something) refers to KUFU (this word is often used in kendo situations and refers to solving or work something out by experimentation and self discovery. Its an extremely common term in Japanese kendo circles, but has yet to enter the lexicon of non-Japanese speakers abroad). Without kufu, you cannot take a step forward. As the phrase 一撃三省 (ichigekisansho) expresses, if your attack fails you should ask yourself “why was I unsuccessful?”; and if your attack is good you should ask “what did I do to make this attack good?” This reflection is kufu. Why has todays kendo got into the shape it has? The reason we see people practising kendo simply to win, and odd kendo (妙な剣道) has become popular is surely because those people who are acting like this are simply copying the people teaching. Instructors should recognise the true character of Japanese kendo, and teach this correct kendo. If they do so then we can fix the problem quickly. Please change this confused and messy kendo into something splendid. Including me, we all have a responsibility. On this platform, I dare to beg all the kendo instructors of Japan to take up the burden. Thats why I am standing here and addressing you all now. What I would like all instructors to do – those present and others that aren’t – is to take this message: “in order to develop good students, you must become a good teacher yourself,” and its for this reason I introduced “sanma no gurai” first. This is the most important point in the road to regenerate kendo. When you get lost on a path, there is a saying “return to the beginning.” Todays kendo is lost in a maze. I believe it is essential for Japanese kendo to return to the beginning and reassess the situation. Kendo is budo. In kendo’s case, the “bujutsu” of the above corresponds to the “principles of the katana.” Polishing yourself through training in this is the “discipline,” and its from this that the “Concept of kendo” was born. The “discipline” is the method used to reach your objective, “character development.” The “Concept of Kendo” states the method and objective clearly. “keiko” and “shiai” are part of this method, and if you make a mistake in your thinking of them, then you cannot reach the “character development” objective. As shown in the sanma no gurai chart, we should teach the next generation about the importance of finding a good teacher. This is the first step in achieving our objective. Don’t you think todays kendo is simply about winning shiai and/or going up the grading ladder? If this is the case, then the method is wrong. I’d like you all on this occasion to understand the “Concept of Kendo” and become great teachers. I’m am not saying that somehow “sport” is worse than “budo.” Sport has really great aspects. However, sport has no method nor objective clearly stated. Most people define sport as “hobby, competition, body strengthening, etc, i.e. generally exercising and competition.” At the end of the day, there might be times when “character development” occurs, but the fact that this is not stated as a concrete objective is the point that separates kendo from sport. The part: “To mould the mind and body, to cultivate a vigorous spirit, and through correct and rigid training, to strive for improvement in the art of Kendo, to hold in esteem human courtesy and honour, to associate with others with sincerity, and to forever pursue the cultivation of oneself” in the “Purpose of practising kendo” is about character development. The rest: “This will make one be able: To love his/her country and society, to contribute to the development of culture and to promote peace and prosperity among all peoples” is about kendo’s effect on society in general. Its this that gives kendo its characteristic. The splendid “Concept of kendo” was devised with great effort but it basically became nothing more than simply words. Because this shouldn’t have happened, recently a new “Mindset of Kendo Instruction” was created. The “Concept” is looking from the viewpoint of the student, whereas the “Mindset” is from that of the teacher. It is really splendid. There are 3 sections, and from that the most important is “The Significance of the Shinai.” In the “Concept” it states “application of the principles of the Katana” which of course leads us naturally to the notion that the “shinai = katana.” This is the tradition of Japanese kendo. What this means is that kendo – that began with “shinken shobu” must, even if we do it in the manner of a combat sport, always keep the “spirit of shinken shobu” alive. If this disappears, then the entire meaning of kendo disappears. This is what I believe. Up until now the “Concept of kendo” has been incomplete. I would like all teachers to understand its with the wish that they understand and transmit kendo as a traditional cultural heritage that this new “Mindset” has been created. Don’t let it become simply words (like the “Concept” became). Depending on how you understand this point we can reform kendo. The official versions of “The Concept of Kendo” and “The Mindset of Kendo Instruction” in both Japanese and English are reproduced below. The can be found on the ZNKR website. To discipline the human character through the application of the principles of the Katana (sword). Kendo is a way where the individual cultivates one’s mind (the self) by aiming for shin-ki-ryoku-itchi (unification of mind, spirit and technique) utilising the shinai. The “shinai-sword” should be not only directed at one’s opponent but also at the self. Thus, the primary aim of instruction is to encourage the unification of mind, body and shinai through training in this discipline. I have always been a believer that the “right” way in life is rarely the “easiest”. Where I am from, some of the principles that are held in esteem in Japanese society are not always appreciated in my “culture” (i.e; not pressuring someone while driving, honesty, holding the door open etc etc). What I am saying is that, although I put the culture of kendo into my everyday, it doesn’t usually benefit me in my society and is almost looked upon as weak or weird. Having said that I will never stop doing it now that kendo and exposure to Japanese culture has allowed me to learn the value of courtesy, even when it is to my detriment. Really enjoying these articles! I certainly agree with Morishima that todays Kendo is lost in a maze. Furthermore the burdens and distractions of everyday life adds to the struggle of remaining focused on the correct path. I’m glad to hear that ‘Sanpomamori’ got a bad rap. I must confess it’s something I’ve picked up from watching a lot of competitive shiai mostly from the All Japans and High School comps. If you have time to block why not just attack instead?! @Reuben = this was a monster to translate! Almost finished. I hope I am doing the original service….. Thanks for doing this. I find this topic of discussion fascinating though I am still not sure how i will view the conclusions…please keep them coming! Just to expand on Sanma no Kurai. Sanma no Kurai was an innovation of Yagyu Hyogonosuke Toshitoshi, the 3rd soke of Shinkage-ryu. The “ma” means “polish”, so this is “three layers of polish”. (Incidentally, Morishima-sensei got the kanji wrong; it’s 摩, not 磨, although meaning is essentially the same.) In Shinkage-ryu, we refer to narai/oshie (teachings), keiko (practice), and kufuu (innovation), rather than shu/ren/ko. Again, essentially the same thing – just a slight difference in expression. If you look at the picture of the blackboard, you’ll see he’s drawn a circle with three equidistant points on it. This is a representation of the Sanma no Kurai concept, and is very important. It represents an endless cycle. He’s labeled the points, but traditionally they are not labeled, because there is no one point where narai ends and keiko begins, no point where kufuu begins. For example. You have the basic Shinkage-ryu straight cut. You see your instructor demonstrate the cut. He’ll give you some various pointers, kuden, and requisites for a Shinkage-ryu cut: weight on the front leg, back leg extended, hips and shoulders straight, navel pointing downwards, the cut moving freely and naturally, etc. This is “narai”. Now you practice it — keiko. While you practice, you are constantly reflecting on these “narai”, trying to embody them, trying to mimic your instructor. But mindless practice just won’t cut it. Nor can you rely on mimicry. Your body is not the same as the instructor’s. In order to embody those narai, you must find the way *your* body can do it. This is kufuu. And through this kufuu, you suddenly come to a fuller, *personal* understanding of the narai. And now the process starts again, continuing until you die. And process continues for everything: straight cuts, diagonal cuts, waza, kata, your “kokoro”. Concentric circles continually revolving, no end in sight. What I find fascinating is that this theory of learning was created 400 years ago, and yet I find it quite applicable in teaching English. In fact, it’s almost like language learning is catching up with Hyogonosuke: a common model for language lessons now is Presentation (narai), Practice (keiko), and Production (kufuu). Thank you for this translation, George! Really great stuff! In early 2008 we had a lecture on Sanma-no kurai at the jodo seminar by Ueda Kayoko-sensei in Moscow. It was difficult to follow with the translator trying to translate it on the spot. Now I can much better see what was meant. @Jeff – Morishima didn’t get the kanji incorrect, I did. The picture above is not him btw, its someone else. I also assume that although the Japanese term may have come about 400 years ago, what it represents was probably part of human knowledge in many cultures. As you rightly pointed out, it still holds true today as it did 400 years ago (and I assume the 400 years before then as well! ).